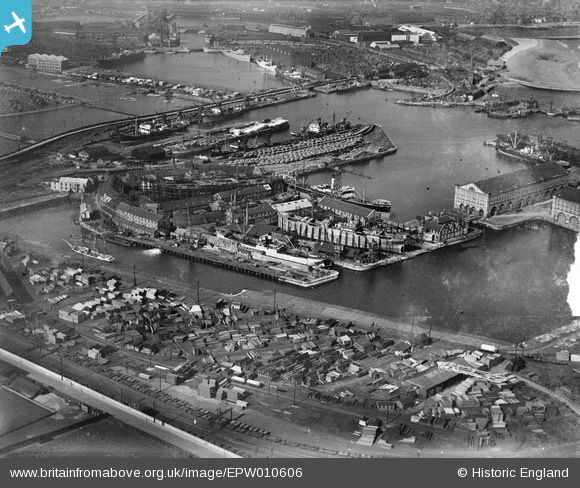 North Basin (1880) leading into Old Harbour and Victoria Dock at (Old) Hartlepool. The Timber Ponds, opened in 1856 and extended in 1880. The sandy beach formed between the North Pier of West Harbour and the jetty guarding the southern entrance to Old Harbour. 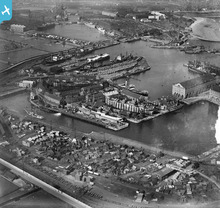 The Graving Docks and Shipbuilding Yards of William Gray & Co. Ltd., where modern ship construction took place from the wooden ships of the 1830s to the iron and steel products from the mid-Victorian era until the yards closed in 1961. Railway sidings of the North Eastern Railway, Hartlepool & West Hartlepool Line. Hartlepool is a classic example of a town which has been transformed, as it has undergone a remarkable revival since 1945. In particular, a whole series of public and private sector investments has seen the old port and heavy manufacturing centre change beyond recognition over the last thirty years. In 1914 West Hartlepool was at the height of its prosperity. A product of mid-Victorian times, the town grew rapidly to become a major coal port, steel and shipbuilding centre. 42 shipping companies were based in the Hartlepools, owning 235 ships between them. Half a century later and most, if not all, of these activities had disappeared, to be replaced with an emphasis upon leisure and tourism, particularly in the last 30 years. This view, looking north-east, was taken during the heyday of Hartlepool's maritime tradition of coal exports and marine engineering. By 1862 the harbour at West Hartlepool comprised of 44 acres, mostly of deep water docks, which could accommodate vessels of increasing tonnage, so that the port became one of the leading exporters of coal and coke in the region.After the peak years of the 1920s, a steady decline set in until the final shipment took place in 1971. The last ship to be built at Wm.Gray's was a decade earlier, in 1961. Today, the scene is very different, as the emphasis has been placed on retail, leisure and tourism. Swainson Dock was filled in by 1968, two of the former docks, Coal and Union, have been converted into a 400-berth marina, and an impressive Historic Quay has been established on the west side of Jackson Dock in the last 20 years. "Welcome to the North East's Premier Maritime Attraction: Hartlepool's Maritime Experience, Home of the 1817 HMS Trincomalee!"